The butterfly turning table consists of two assembly tables - the feeding table and the receiving table. It can be used universal for the production of wall, roof, ceiling and gable elements. These two assembly tables automatically turn the element, so both element sides can be processed and they. After finishing the first element side the receiving table drives towards the feeding table and takes over the element. On the receiving table the element can be finished. The whole turning process can be realised in just 100 seconds. 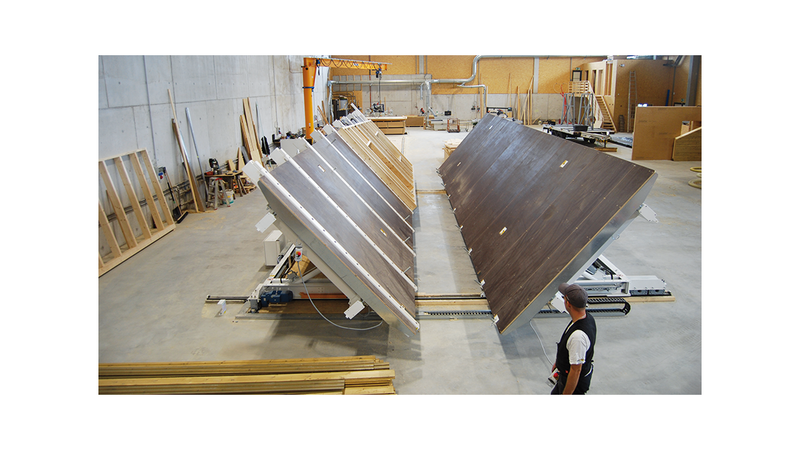 The proven WEINMANN solution for a fast and save turning is appreciated by timber framers worldwide, beacuse of the flexibility, the less space requirement and the simple operation.